Lets do something out of our comfort zone, lets learn wealthability! 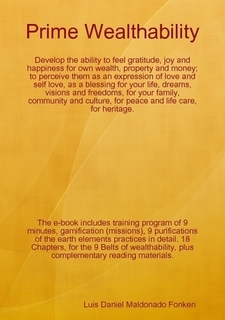 The Prime Wealthability is an e-learning program that provides to you a set of modules with essential training, a foundation, for the development of primal wealth ability ( or the ability to generate, care, nurture and sustain wealth). PURPOSE:What means happiness and peace? Why is the earth element so important? We will answer these questions along the e-learning process towards the prime wealthability knowledge. reach true happiness with own wealth. self love and love through wealth. care for peace, family, culture, life, heritage through wealth, property and money. create wealthy business, professional skills, services, products or goods. reach reconciliation between your heart and life with wealth, property and money. experience joy, gratefulness and creativity with own wealth. What is prime wealthability ? Where it comes from, how is it generated, for what is wealth used? Wealth defined as property can include money, as land or infra-estructure, technology or even patents, documents, or intellectual property, arts objects. For some cultures, property includes culture, peace, rights, duties, politics, government, and industry or economy, DNA, and other values associated to heritage, legacy and family. Is human kind wealthy ? as species ? Wealth should include the ability to generate wealth, sustain it in time, use it according to own ethical guidelines. May wealth be used for the care of peace, family, culture, life, heritage; then would the species have more chances for survival, there for continue in a state of wealth longer. This possibility, considered as a variable, increases the wealth factor of a community, culture, family, or individual. Which would be the ideal variables of wealth to be considered for the management of own life, decision making, choices, preferences? Can we now create the Math for wealth ? This site will be dedicated to discuss wealth from the point of view of the prime culture and the primes, as well discuss on wealth definitions and approaches developed by human kind along its history=present=past=future; and other alternative visions of wealth created by human kind or perceived, as feasible, wished or possible.